TUNDRA TABLOIDS CALLED IT RIGHT: FLOTILLA OF THE HUNS: THEY OPENED FIRE ON ISRAELI NAVY ENDING IN 14 DEAD……. – The Tundra Tabloids……. TUNDRA TABLOIDS CALLED IT RIGHT: FLOTILLA OF THE HUNS: THEY OPENED FIRE ON ISRAELI NAVY ENDING IN 14 DEAD……. 19 EUROPEAN LEGISLATORS WERE ALONG FOR THE RIDE IN PLANNED TERRORIST ATTACK AGAINST THE ISRAELI NAVY. This makes it the very first time in history that European legislators were among those who were planning and then carrying out a terrorist attack against the state of Israel. “Among the Swedes on board is Ulf Carmesund, international secretary for the Social democrats’ Brotherhood movement (Broderskapsrörelsen), the only organization in Sweden openly working with the Muslim Brotherhood.And member of parliament for the Green party Mehmet Kaplan, who invited the Muslim Brotherhood into Swedish parliament. And Dror Feiler, who openly calls for Israel to recognize Hamas. These guys are hardly innocent activists. NOTE: Dror Feiler is the notorious ex-Israeli traitor that made an “art” presentation with a pond of blood with a picture of a terrorist floating in it that Israeli Ambassador to Sweden, Zvi Mazel, damaged by throwing a lamp into it. Army says at least 10 activists killed, dozens injured, six Navy commandos wounded as protesters open fire in violent Israeli takeover of Gaza flotilla. International activists aboard the flotilla of ships on their way to the Gaza Strip opened fire on IDF soldiers who boarded the ships to prevent them from breaking the Israeli-imposed sea blockade, the IDF said Monday. According to the IDF, the international activists “prepared a lynch” for the soldiers who boarded the ships at about 2 a.m. Monday morning after calling on them to stop, or follow them to the Ashdod Port several hours earlier. According to IDF reports, at least 10 acitivists were killed during the ensuing clashes as well as six Navy commandos, some of them from gunfire and at least one in serious condition with a head wound. Foreign reports claimed that the number of dead was close to 15. Some of the wounded were evacuated to Israeli hospital by Air Force helicopters. Upon boarding the ships, the soldiers encountered fierce resistance from the passangers who were armed with knives, bats and metal pipes. The soldiers used non-lethal measures to disperse the crowd. The activists succeeded in stealing the weapon from one of the IDF’s soldiers and reportedly opened fire, leading to an escalation in violence. The IDF said that the ships would be taken to the Ashdod Port where, despite the violence, the cargo that are carrying will be inspected and then transferred to the Gaza Strip via land crossings. Israeli Navy commander Vice-Admiral Eliezer Marom was commanding over the operation from sea. The Navy made initial contact with the flotilla at 11 p.m. on Sunday ordering the ships to follow them to Ashdod Port or otherwise be boarded. The actual boarding of the ships took place at 2 a.m. Monday and was yet to be completed by 8 a.m. 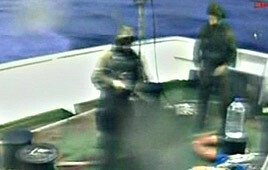 Activists aboard the ships repeatedly said they would not respond with violence to the navy’s interception of their flotilla prior to the boarding. Al-Jazeera reported Turkish leaders called an emergency meeting to discuss responses to the attack at sea. The Israeli ambassador in Turkey was called in to offer explanations, according to a report. Hamas Prime Minister Haniyeh came on Al-Jazeera to condemn the “brutal attack” and called on the UN to intervene on the activists’ behalf. The ministry condemned Monday’s raid on the ship carrying pro-Palestinian activists, called it unacceptable and demanded an “urgent explanation” from Israel. It says Israel violated international laws and will suffer consequences. Previous Post Previous Post OBAMA DOES THE DIRTY WITH THE UN IN US BACKING OF NUCLEAR RESOLUTION…….